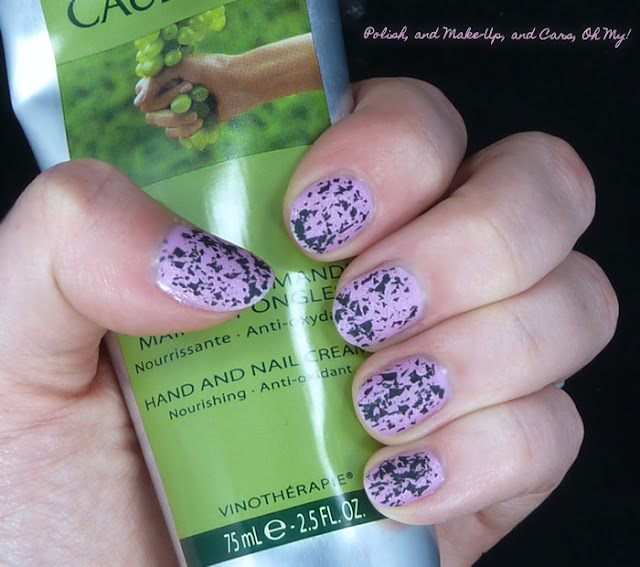 Fashion Polish: Guest Post : Bridget from Polish, and Make-Up, and Cars, Oh My! imagines a Barbie rock star mani! Guest Post : Bridget from Polish, and Make-Up, and Cars, Oh My! imagines a Barbie rock star mani! Today, I am very happy to share with you all another great and deserving blogger. Bridget is relatively new to blogging but is already really talented. I'm excited and honored to be featured as a guest post on Sam's blog! She is one of my top favorite bloggers not just for her ridiculously amazing photos, her fair and descriptive reviews, but she's an all around sweetheart. I'm just a regular person that share's this same passion (or obsession!) with many people. 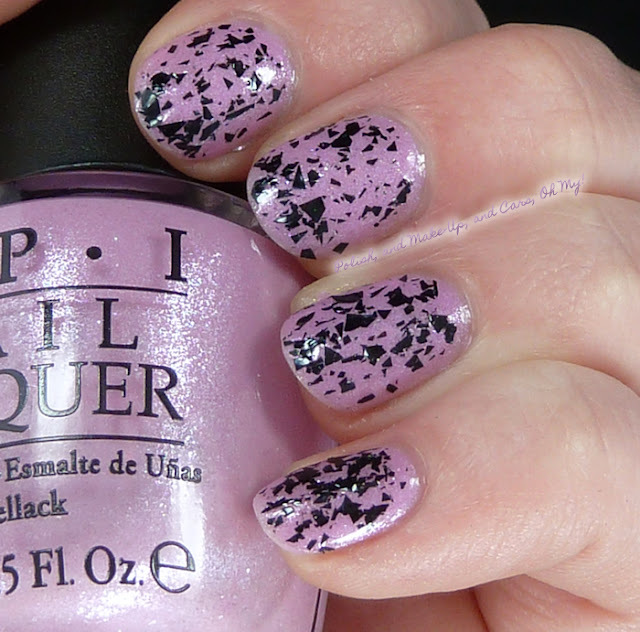 For today, I chose OPI 'Pedal Faster Suzi' which is a light purplish-pink with a silver glass fleck as my base and then topped it off with Indy polish maker Lacquistry 'Shredded' which looks like black pencil shavings. I topped it all off with Essie's 'Good to Go' topcoat but then I decided to mattify my mani with Essie's 'Matte About You'. So, there you have it, I'm not a girly girl by any means but it sort of has a 'Barbie rock star' sort of look to it. I hope you all enjoyed this mani! Thanks again to Sam for this opportunity! To visit Polish, and Make-Up, and Cars, Oh My!, you can either follow the link or click on the image below. Thank you for visiting girls! i love how it looks matte!! you did amazing Bridget! I always like black on this Suzie shade. Shread is always fun! Many have not liked this Suzie shade from the Holland collection - but I liked it right from the start. Enough lavender to the pink and the kind of glass fleck thing that OPI has been doing (wish it was the glass fleck we see in days of old from CG)...anyhow, there were a # of shades I really did like in the Holland collection. Bridget, this looks amazing - you actually made the delicate hue of Pedal Faster Suzi look so modern & urban...love this! I adore Shredded. How cool would a holo version of that topcoat be? I really like the look. I so have to learn how to do this as I only have a french Mani on atm. Looks to be alot of fun. Am new to this blogging thing. But have enjoyed reading your blogs.